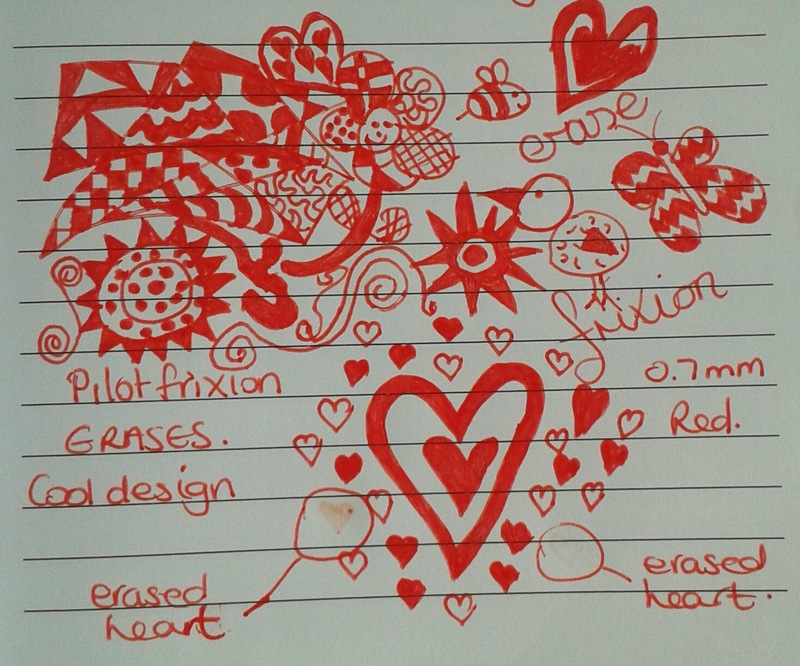 Check out my Pilot Frixion pen - thanks to the Pilot Facebook competition and lady luck who was on my side that day. It looks pretty smart in my opinion. 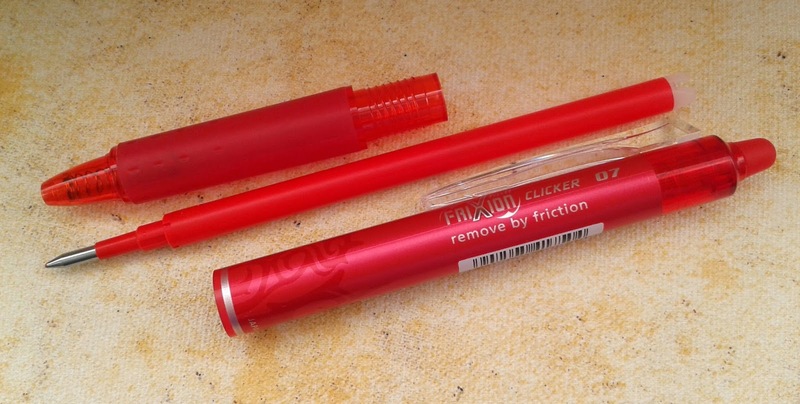 The pen houses red ink so it's only right that the body of the pen should be red too, a bold colour and design which shouts out 'Yo, Frixion in da house!'. The pattern is a swirly, tribal type pattern but also not dissimilar to a bit of cool graffiti which makes this pen perfect for school kids and students who like their pens to have a bit of edge and personality, just like them. The pen is made mainly of plastic with a smooth rubber grip and a clear plastic clip which being clear doesn't intrude on the design at all. The main attraction is it's ability to erase ink. The eraser is located at the end of the pen and is still confusing me as I keep trying to press it thinking it's my clicky button. It's not my clicky button, the clip is but because it's clear I keep forgetting it's there. I'll catch on eventually. I will admit, I wouldn't usually go for an erasable pen. Mainly because I remember back in the day erasable pens had a habit of erasing the paper along with the ink and I never really bothered to find out if any progress had been made. The pen uses friction generated heat to make the ink disappear like magic. I was actually pleasantly surprised at how well it erases. I did need to rub the ink quite fast and hard to create the friction but it definitely does as it claims and erases. I'd say it works just as well as I would expect a pencil eraser to work only I had the benefit of no rubber shavings. The funny thing is, although there are no left over rubber shavings I still wipe the area with the side of my hand as if I'm wiping them away. Again, I'll catch on eventually. After erasing I could still very faintly see the words but I would have expected the same with a pencil to some degree so I was impressed. Once I'd written over the erased area I wouldn't have noticed any difference unless I was actively looking for it. Larger areas of colour were a little more difficult to erase convincingly but for normal text I can't really ask for anything more. Another magical feature of the pens erasability is that if you pop your writing in the freezer for a little while your erased words will reappear. In my freezer test the writing did indeed reappear, even if it was a little faint and bitty but it came back. Not that I can see myself ever needing to freeze my work back into existence but the option is there all the same. Maybe you like to think of yourself as a top secret agent and the only way to get an important private message to someone is via erased Pilot Frixion. Then the freezer thing makes complete sense. 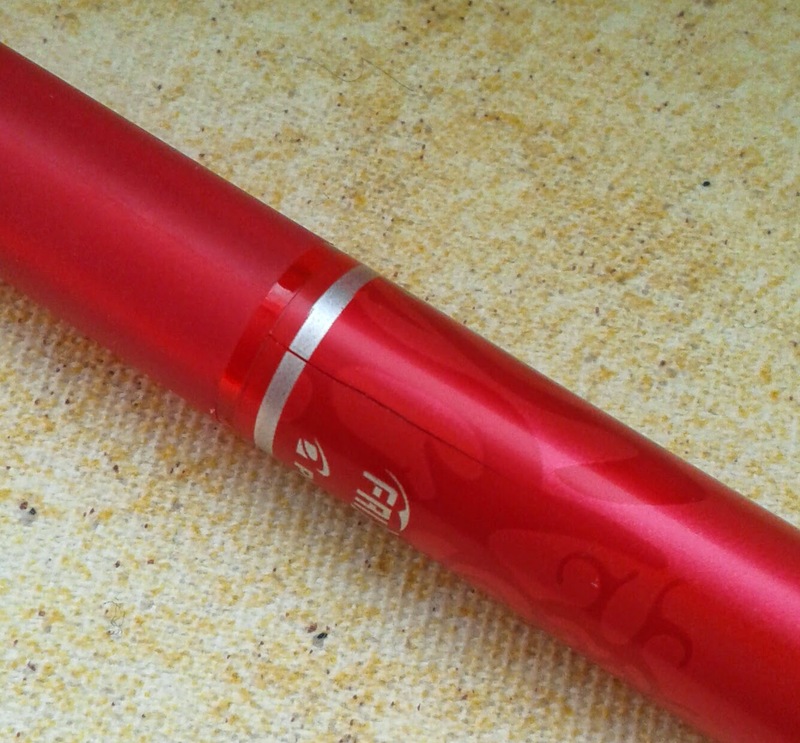 There are some interesting facts about the Frixion ink over here if you want to read more. I found it quite interesting that if you leave your notebook in the heat for a while, for example outside in the sun, you may find that your writing disappears. However it should reappear after popping in the freezer so maybe I ought to clear some freezer space as I may end up finding my notebooks in the freezer more often than I first thought. I suppose these small inconveniences are the price I have to pay for a decent erasable pen. I'll probably sit in the shade with this one. The smooth rubber grip feels nice beneath my fingers and does its job well. The pen stays put when I'm writing which I've learnt very quickly is not something to take for granted. 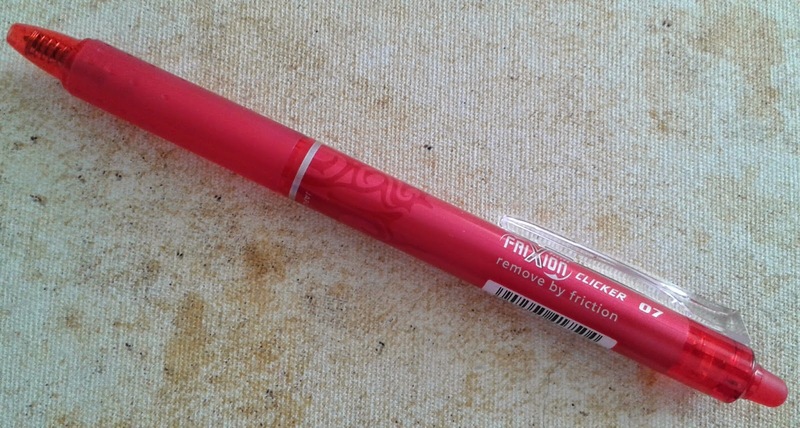 The Frixion is light and evenly balanced which means I can use it for long periods of time before getting tired hands. The grip (yes I'm moaning about grip positioning again) would be more pleasing if it were a little closer to the tip. I say this so often that I wanted to show you how I like to hold a pen so you can understand what the heck it is that bothers me so much. If you look at the tips of my fingers they hang over the edge of the grip. I get this alot. 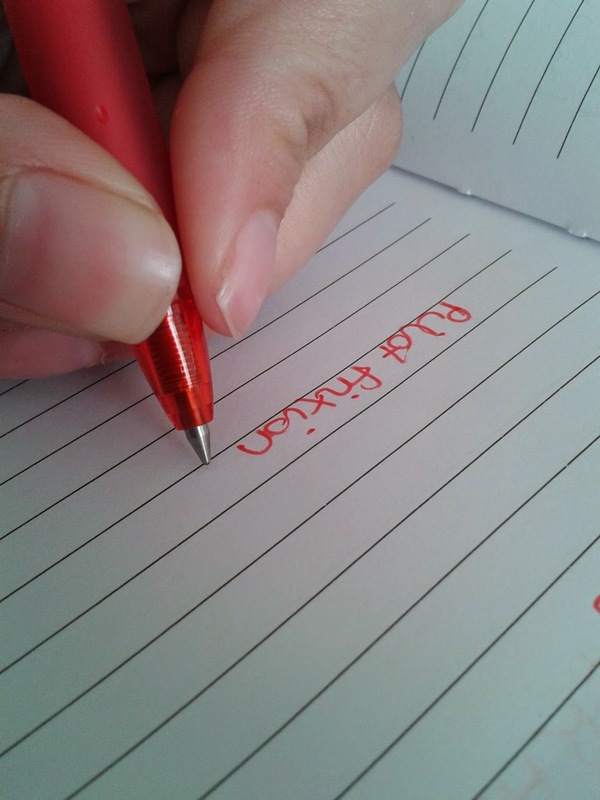 I've been holding pens this way all my life and I know I have complete control of the pen when I hold it in this way. When I'm having to adjust my positioning to suit the grip it takes me a little while to regain control and the quality of my handwriting suffers. I know it's me and I should probably adapt to each individual pen rather than whine about it each time but the stubborn side of me overpowers my reasonable side. Luckily the grip is smooth and soft so it is still comfortable to hold even when I've got my stubborn face on. The ink appears quite watery and wet at first but dries fast enough for me not to have to worry about smudges. The pen has its occasional skippy moment, usually when I'm writing in a hurry so slow and steady wins the race where the Pilot Frixion is concerned. It feels great on paper. There's no dragging or scratching. It's just easy going, a smooth ride. The 0.7mm tip gives a nice line width, likely to please most people including me. I get clear lettering no matter what the size of my handwriting and I haven't had any feathering at all so I can be fairly confident when using the Frixion on unfamiliar paper out of the house that it is unlikely cause me any embarrassment. The Pilot Frixion is refillable and available in a variety of bright and snazzy colours including my favourite - Green. I wouldn't mind giving all the colours a road test and my notebooks and doodles always look so much friendlier with a bit of colour thrown in amongst the black and blue. 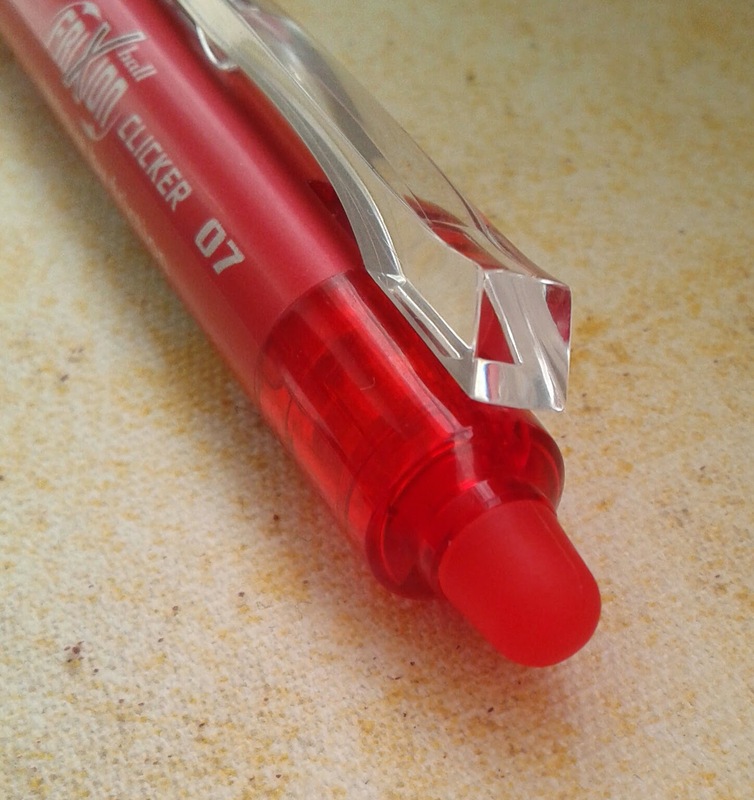 The refill in this pen doesn't make it easy to see how much ink is left as it's made from red plastic so I have to hold it up to the light so I can see where the ink line is. To refill this pen, unscrew the body just below the grip and the refill will pop out easily. When screwing the pen back together do it with care, as my pen has ended up with a crack down the side of it and only needs screwing a tiny amount before it clicks out and comes undone again. It's one of those things, I'm not sure how it came to be cracked, I only noticed after the crack had appeared. I've noticed the tighter I screw the pen together the wider the crack becomes. It annoys me as I try so hard to take care of my beloved pens but sometimes it's just not enough. Overall I'm pleased with my Pilot Frixion. I wish it was a little more hardy as of my pet hates is a refillable pen that is easily broken and can't even outlast the life of one refill. Putting the annoying crack aside, it's a fun pen that can often be found on my sons desk thanks to its cool design and it's fun factor. I won't be taking this pen to work as I want to avoid having to keep tabs on who's desk it is currently being 'borrowed' at and the avoid any pranksters erasing my days work. It's a pen that is capable of creating quite a bit of entertainment for imaginative children, teenagers and adults no matter what age and I will definitely be seeking out the green for my collection. If the Pilot Frixion were a classmate it would be the class clown and everybody liked the class clown whether they were prepared to admit it or not. 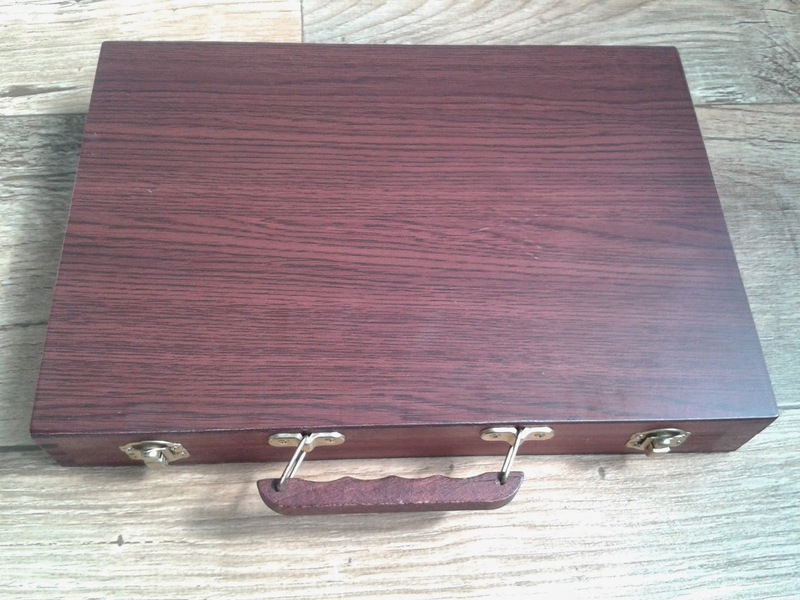 What could be in this cute little wooden case? 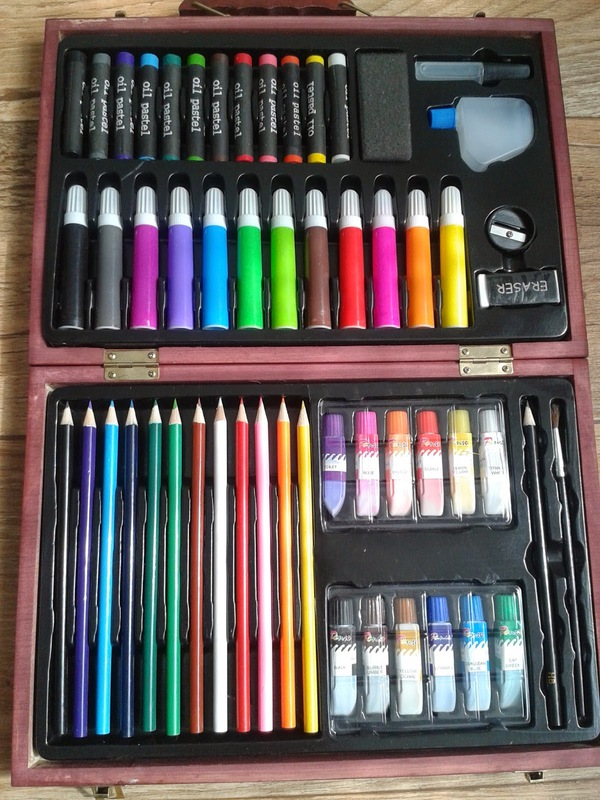 12 watercolour tubes, 12 colouring pencils, 12 marker pens, 12 oil pastels, 2 palettes, 1 sponge, 1 water bottle, 1 HB pencil, 1 paint brush, 1 pencil sharpener, 1 eraser and 1 glue. I was lucky enough to win this in a competition with Ryman Stationery along with some other wonderful bits of colourful stationery that look perfect on my desk. 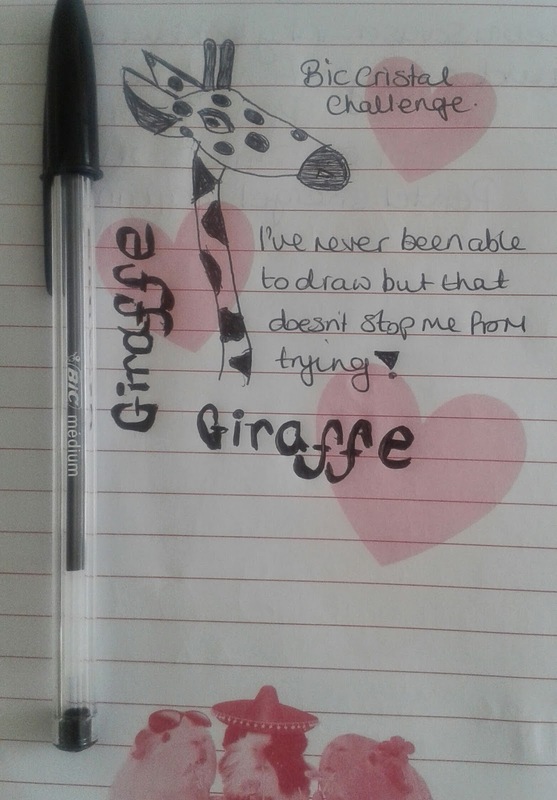 The thing is I'm not the artistic type. I'm more of a doodler and I feel like this set is wasted on me as I would never be able to create the kind of amazing art that this set deserves to be used for. So here's where you come in. I'd like to give this set to someone who can give it the home it deserves! Just enter via the rafflecopter below and good luck! If you simply can't wait to see if you've won then feel free to pop over to Ryman Stationery and purchase it straight away. UK entries only. Giveaway ends 4th August 2014 at 12.00 am. This competition is not sponsored by anyone. I am providing the prize myself. The winner will be randomly chosen via Rafflecopter. If you comment anonymously please leave me your name in the rafflecopter box so I can match up the entries. Entries without comments will be disqualified. 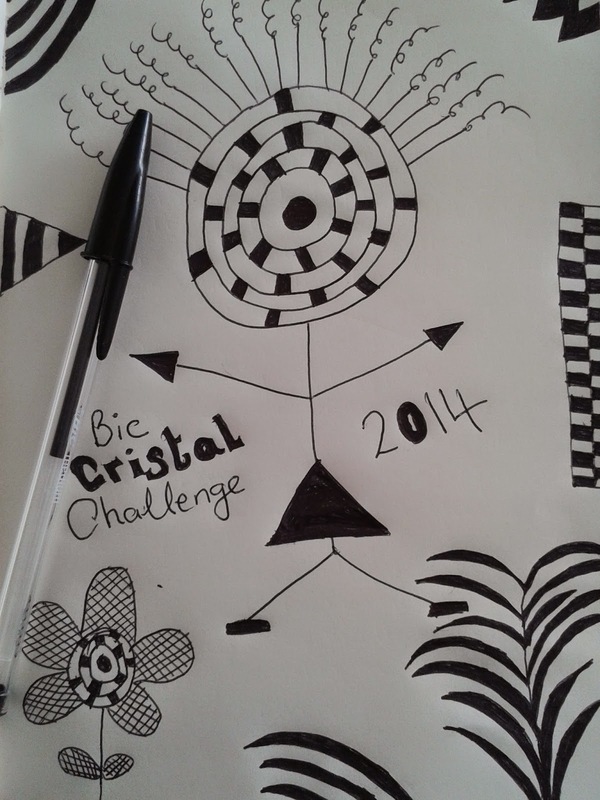 Bic Cristal Challenge - How tough can it be? 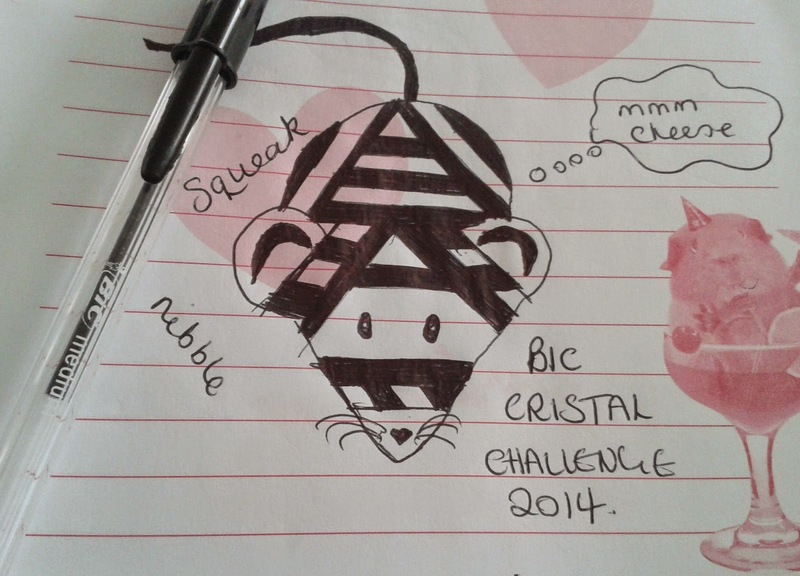 Bic have started a brand new Bic Cristal challenge - Finish your pen and get £10. 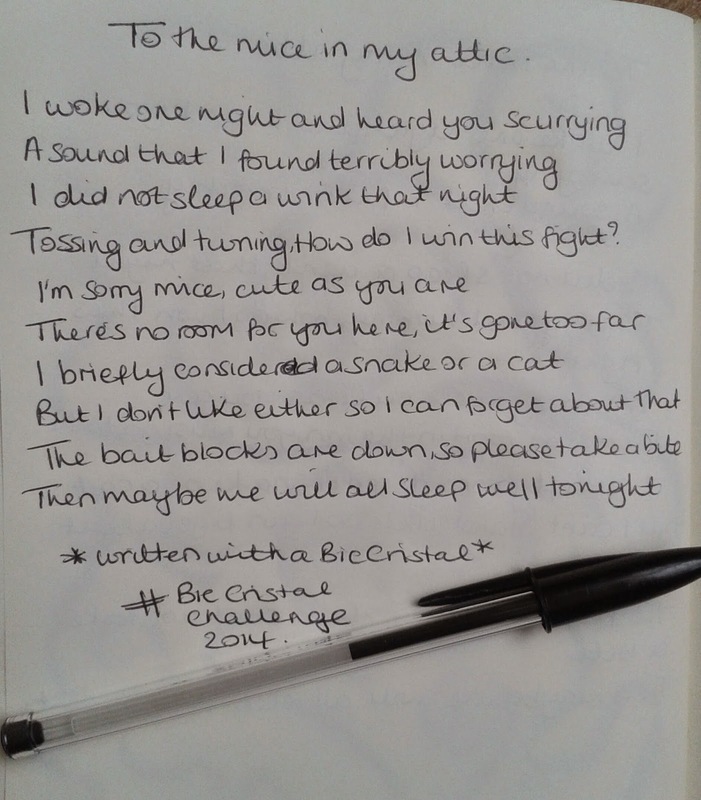 All you have to do is use up all the ink in your Bic Cristal from one of the special packs (available at Asda, Sainsburys, Staples, Ryman Stationery and WHSmith ) head over to their facebook page, fill in a form, send in your pen and a tenner is yours. Keep your receipt in a safe place, you will need it when you claim. Sounds easy doesn't it? My guess is that it may not be as easy as it sounds. 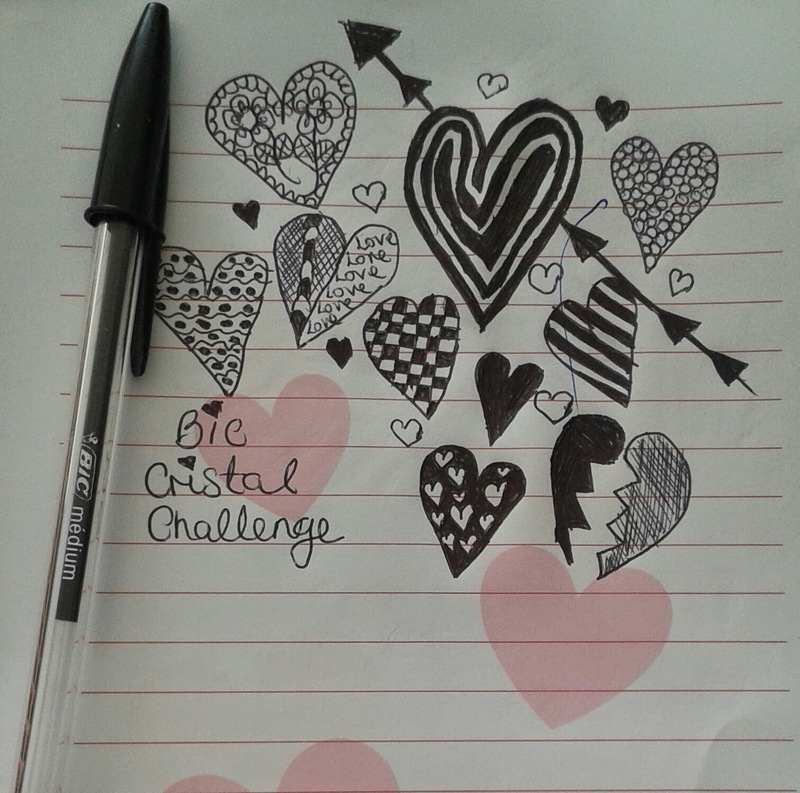 These pens claim to "write up to 2 times more than other usual ball pens" so I'm going to share my Bic Cristal Challenge with you and together we will see just how easy (or not) it is to empty one of these things. 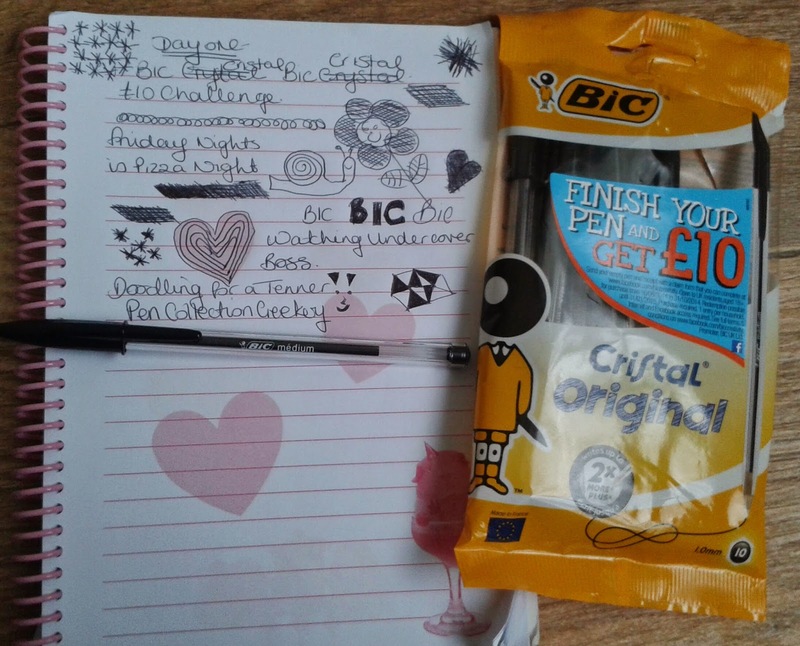 The weekly shopping trip at Asda ended with a quick browse of the Stationery Isle and the purchase of these Bic Cristal pens. After the extremely boring task of putting the shopping away I sat down to watch Undercover Boss (love that show) on catch up and drew a few doodles allowing Cristal and I to get to know each other. Cristal will remain with me at all times until the challenge is complete and I'm sure we will become the best of friends. Cristal came to work with me today and spent the day attached to my lanyard, ready for use at a moments notice. I was a little worried Cristal might get lost either by freeing herself from the lid, never to be seen again or being knocked off at some point without me noticing. Thankfully neither happened and she lived to see day 3. It's Sunday which means it's lazy day. Not much has been going on. A few dates were written on the calendar, a to do list for tomorrow has been scribbled in my notepad and a quick diary entry. I think I'm going to have to do better than this if I want to empty this pen of every last drop of ink any time this century. 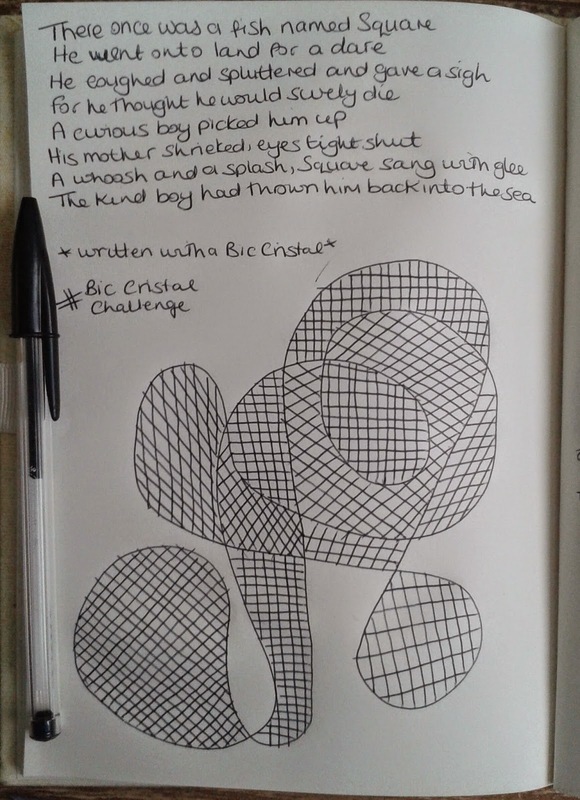 Cristal has been busy with me at work again, has enjoyed a bit of doodling/rubbish drawing and has written a list of possible presents for my son who managed to get a level 6 in his SAT's English exam and level 5's in everything else. He deserves a treat for all the hard work he has put in to achieve such fantastic results.The ink levels are reducing but very very slowly. It's happening, the ink levels are going down. 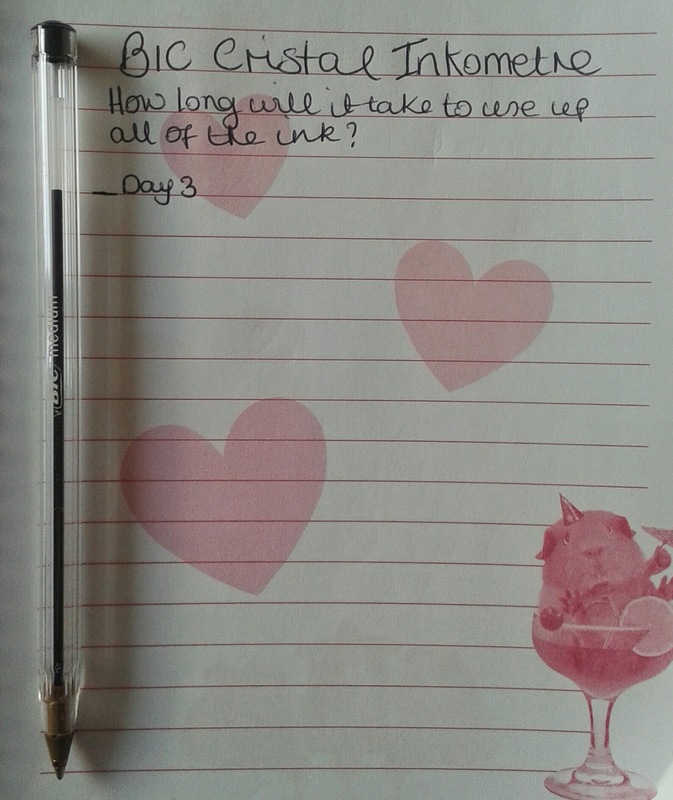 I was beginning to think the ink was never ending which under normal circumstances would be a dream come true but not so good for this challenge. I've been trying out some ink heavy doodles to see how quickly I can use the ink and I must say, Bic don't make it easy. If it wasn't for the fact that I'm using this one pen at every opportunity, I would have barely used a drop. This is one long lasting pen and there's a long way to go yet. 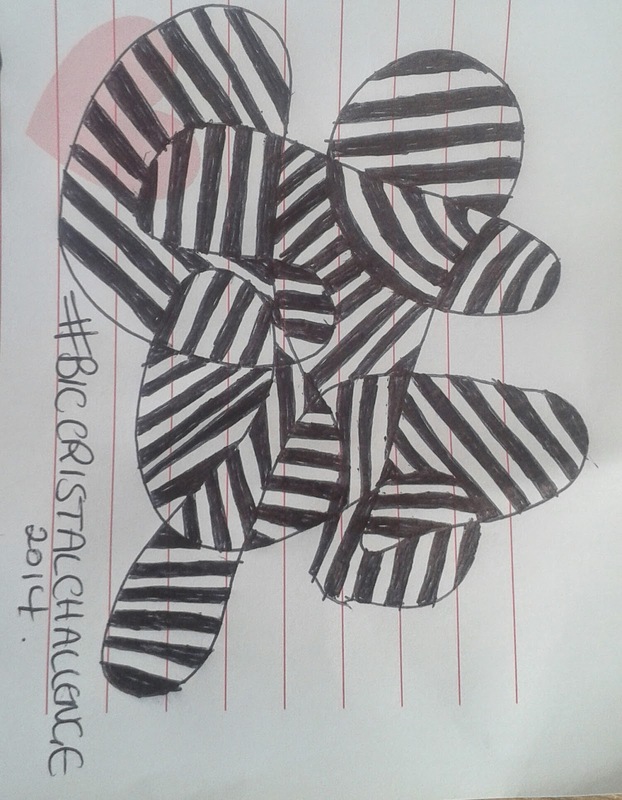 What do you see when you look at this stripy doodle? From this angle I see an angry Koala and my son sees a rocking horse. From this angle I see a skunk burglar making his getaway. What do you see? I'd love to know! It's been a slow few days writing wise so while I was catching up on the last few days of Big Brother I did a few doodles to try and relieve Cristal of a few more drops of ink. 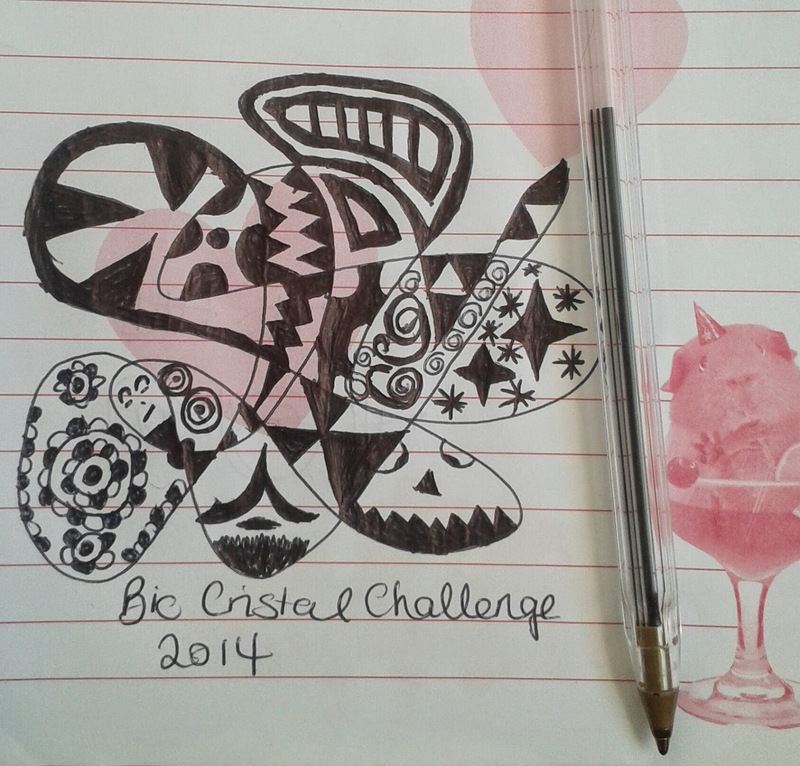 I thought that since quite a few of the BB housemates seem to be pairing up I'll doodle a few hearts. I can't believe Steven is already confessing his undying love for Kim (cringefest) and I'm dying to know why she left the house. Ash and Helen - saw that coming a mile off. And Bianca - pure entertainment, shame she had to be evicted. I very nearly lost Cristal at work. That definitely taught me a lesson. Cristal must be clipped to me at all times as a Bic seems to be fair game at my place of work - finders keepers. 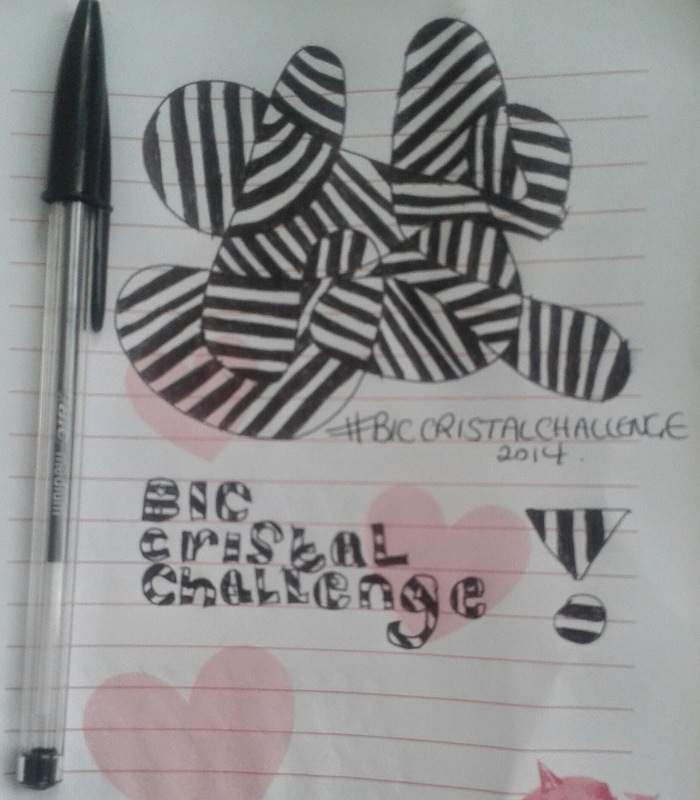 If I were to try to explain to my colleagues why Cristal is different to the other Bics and tell them about the challenge Cristal is trying to complete they would no doubt think I'm bonkers. And they would probably be right in thinking so! I know, it's been a while, but better late than never! It's safe to say the ink is long lasting. If it wasn't for me drawing daft pictures in order to deliberately use up lots of ink I'd probably still have most of the ink left. And just think, I bought a back of 10 Bic Cristals. The remaining 9 pens are going to last me at least another year or two if they are just used for general home and work tasks like note taking, list making and so on. My Bic Crystal has been inaccessible to me for a little while. My son took it upstairs and swore he would use up all of the ink doing his homework. 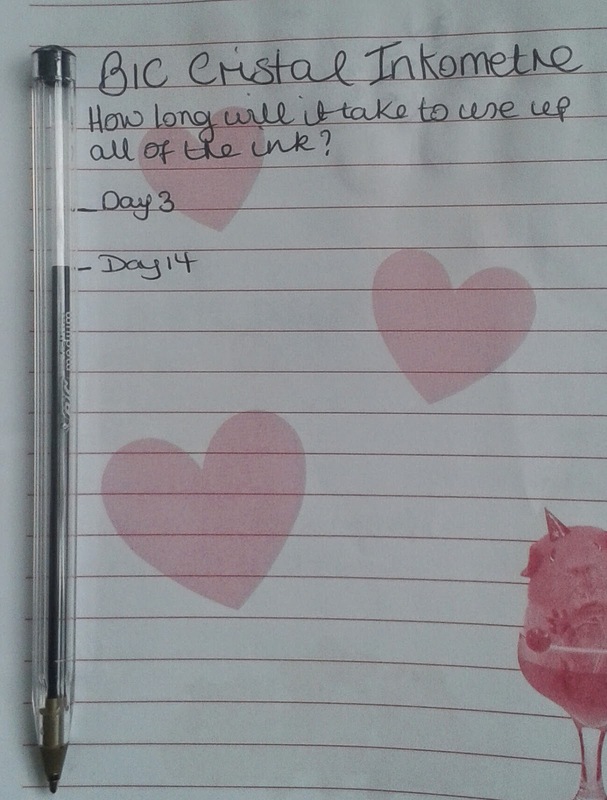 Today I went to see how he was getting on and it looks to me like no ink has been used since the last time I saw it. I've told him that watching online videos of epic fails does not count as homework. 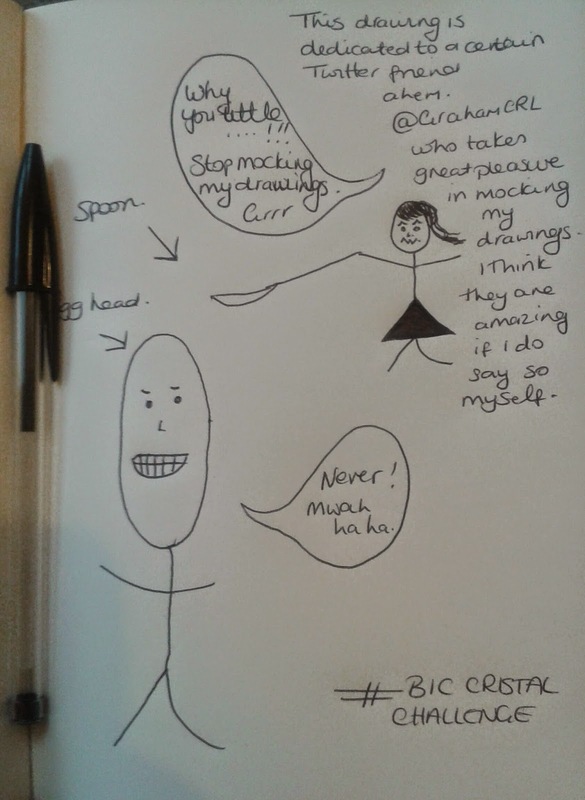 So I'm back to drawing silly pictures again. These are my two Pentel EnerGel rollerball pens. I was fortunate enough to win the blue one in a competition on the Pentel Facebook page. The pink one was bought in support of the Pentel breast cancer campaign. I find it difficult to resist a pink pen at the best of times but when it's for such a good cause I'm more than happy to buy. For each pen sold 25p is donated to the charity. Both pens are retractable, are made mainly of plastic with the pink pen sporting a metal clip and both have a slightly textured rubber grip. These pens are easy on the eye, not too over the top but still inviting. The blue pen is actually a darker blue than the picture shows. The sun had come out to play and was shining brightly on the happy Pentel couple. The grips on these pens make me want to jump for joy. They are everything I ask for in a grip and more. They are the perfectly placed so I can hold the pens as close to the tip or as far away as I like and with the discreet little flick at the end of the grip I can write slip free. The Pentels are light in weight and an average width, not so thin that my fingers gets tangled up in my efforts to hold them and not so thick that they become awkward and clumsy. They are just right - I feel like a modern day Goldilocks and I've just discovered Baby Bears writing desk. It's not just the grips on these pens that I'm smitten with, I'm also totally in love with the ink. The pens feel velvety smooth on paper, each and every mark I make is a pleasure. Imagine your favourite chocolate (Galaxy for me) melting in your mouth, savour every moment, now that's how these pens feel to me to write with. The ink flows freely and consistently leaving a wet look but drying very quickly making them great for left handers. 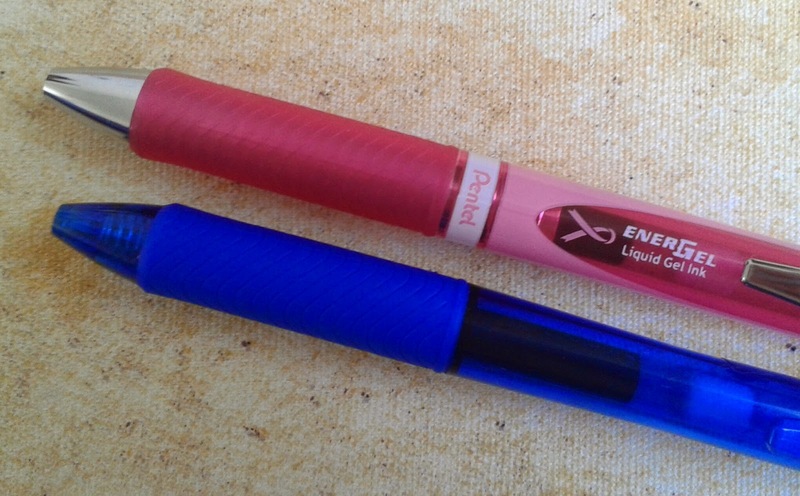 Skipping, false starts or smudging are not in this pair of Pentel Energels vocabulary. 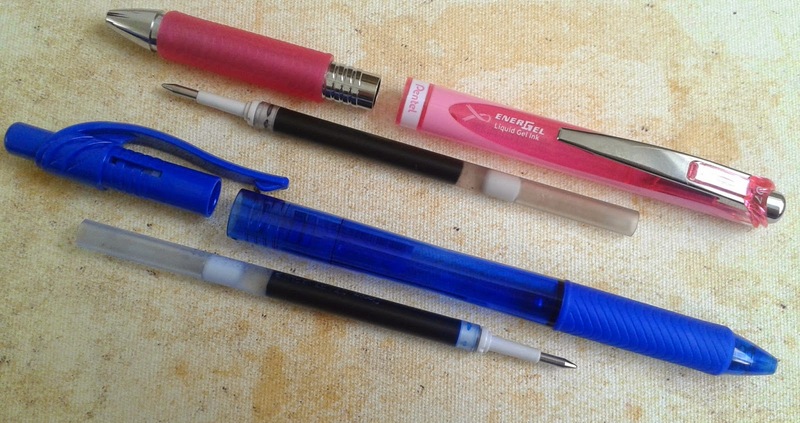 The Pentel EnerGels are refillable and the 0.7mm refills are available in black, blue, red and violet (I would have liked a green but no pen is perfect) The refills are easy to change. These pens unscrew either at the clip or the grip and the refills just sit inside, no messing about, easy peasy. 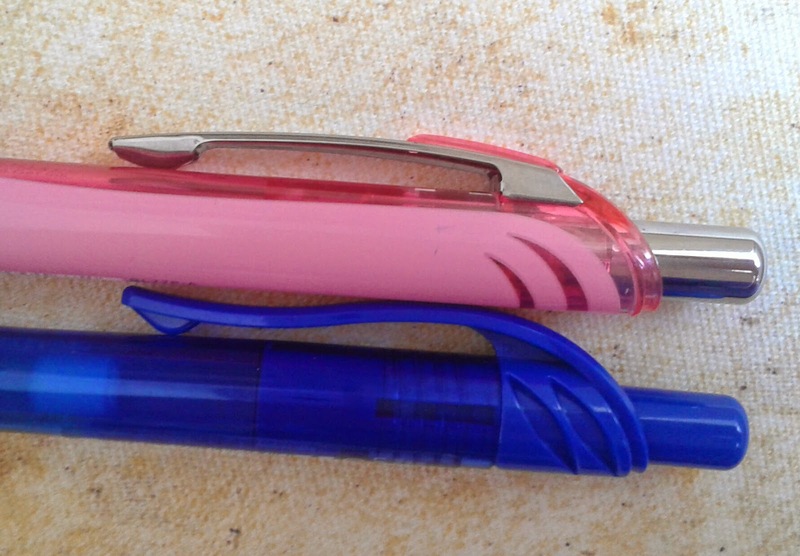 Both clips kept my pens safe in my pocket for a whole day at work, the pink Pentel clip being the one I trusted the most as it clipped just that little bit tighter than the blue pen. The small striped detail near the clips give the pens (and my pocket) character, poking out ever so slightly, taking in the sights of the workplace. My Pentel EnerGels make a good team and are happy to take it in turns for desk time. In order to make this a balanced review I need to talk about the pens bad points - I don't own one in every colour and design, that's unacceptable and must be dealt with sharpish. Maybe my high praise for the Pentel EnerGel seems a little over the top but these pens just keep on giving. Not once have they given me cause for annoyance and every time I use these pens they become my favourites all over again. 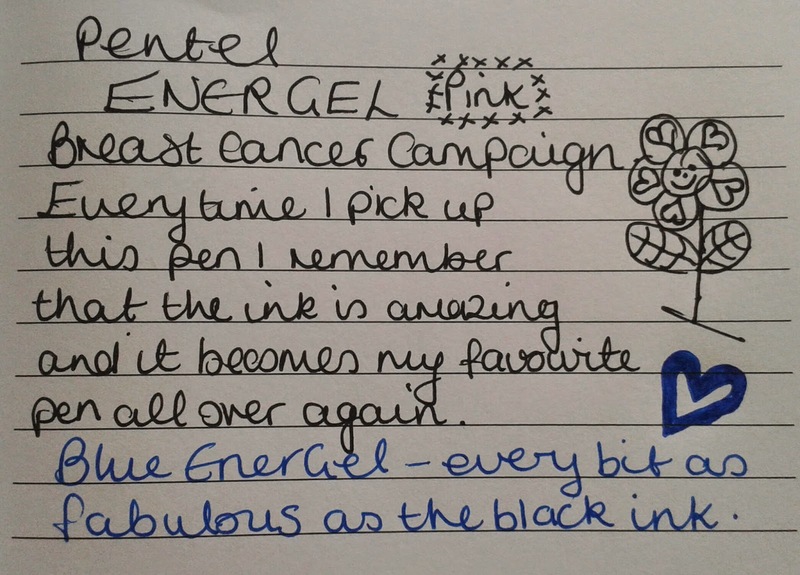 If you want to do your bit and support Breast Cancer Campaign then why not head over here and purchase your very own Pentel EnerGel today.